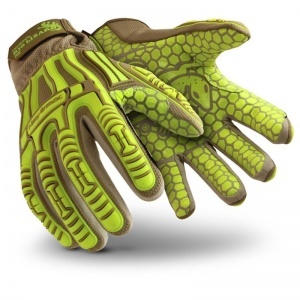 The HexArmor Rig Lizard Silicone Grip Heat-Resistant Gloves 2030 use a silicone grip which has the dual purpose of providing an exceptional level of grip and offering resistance to 250°C contact heat, making them ideal for dry, high heat-risk jobs such as fabrication and glass handling. SuperFabric embedded into the inner lining helps the gloves to achieve the maximum level 5 cut-resistance, while a hi-vis lining adds the finishing touches to a glove that can keep you safe in the dark while protecting your hands from abrasion, cuts, tears and heat. HexArmor are known for their state-of-the-art work gloves, using innovative and forward thinking technology that has refined the field for what safety gloves should offer. The Rig Lizard Arctic Gloves are no different, using HexArmor's IR-X Impact Exoskeleton to provide outstanding flexibility, while additional padding, impact protection and reinforced stitching protect the hands from a wide range of risks. The thumb, index finger and thumb saddle are protected by an IR-X guard, meaning that your hands will stay safe while grippy and handling rough objects and materials. Despite all of this extra protection, outstanding sensitivity and flexibility give you total control when picking up goods and materials. This is perfect in more intricate high-risk tasks such as those found in mechanics, engineering and maintenance. 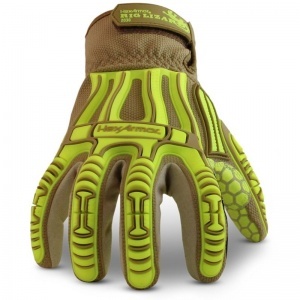 The Rig Lizard Silicone Grip Gloves offer the highest level of cut-resistance available. This gives you the confidence to undertake high cut-risk tasks without worry about injury, helping to provide peace of mind and improve your productivity. 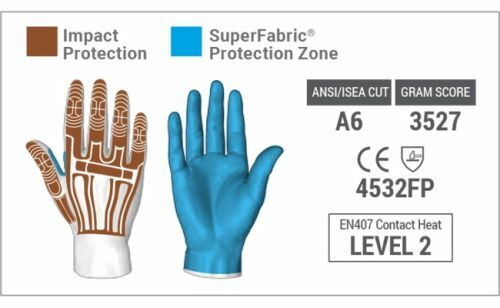 The impressive cut resistance level is met by using SuperFabric on the palm. SuperFabric is engineered to deflect industrial puncture hazards such as a wood splinter or wire strand, using a small guard plate to block high risk threats. This impressive material has had exceptional results, proving to reduce hand injury rates when used in a wide range of HexArmor Gloves. The SIlicone Grip Gloves use a special silicone grip that is designed to improve your grip and offer excellent protection against heat. Level 2 contact heat resistance protects the hands from temperatures up to 250°C, making them well suited to high heat-risk industries such as fabrication, foundry and glass handling.